To perform the steps below, an SD / Memory Card debe estar instalado. Desde la pantalla de inicio, ve a: Settings (Configuración). > Storage > Internal storage. If presented with Terms and Conditions screen, to continue, tap Accept. 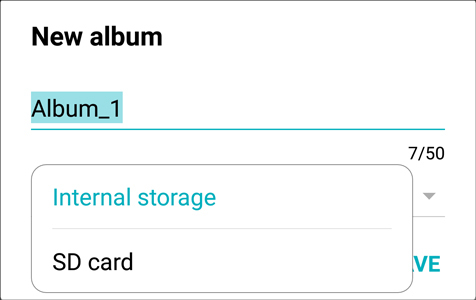 From the Internal storage screen, tap appropriate folder (e.g., Music, DCIM, Ringtones, etc.). For images, select the Gallery app . If desired, open the folder to select files. The file is selected when a check mark is present. Tap the Folder icon . Tap the dropdown arrow then select SD / Memory Card. Navigate to the preferred folder then tap SAVE.